For the four celebrities taking part in the Buy West Eat Best WA’s Celebrity Signature Dish competition it’s been a month long battle of identifying their produce, creating their recipes, practising their kitchen skills and keeping up with the competitive banter with fellow opponents in readiness for the epic cook off event at Elizabeth Quay on Sunday 4th June 2017. With each of the final four dishes featuring ingredients synonymous to each representative region (along with a dash of their celebrity’s personality and flare) there could only be one winner crowned. For 2017 it was Mark Gibson representing the Peel Region. Mark’s dish featured Slow Braised Harvey Beef Shin with Roasted Sweet Potato and Pickled Vegetables and was considered by the judges to be the dish of the day. Partnered by: Southern Forests Food Council Inc. The competition is presented by the Department of Agriculture and Food’s Buy West Eat Best program and aims to lift the level of awareness amongst consumers to the range of produce available from across the State and encourage them to select produce with the Buy West Eat Best logo whenever possible. 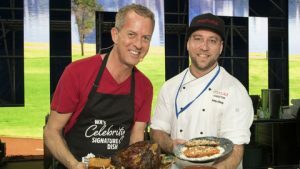 Each celebrity contestant represented produce from State’s four major food producing regions including the Kimberley, Peel, Southern Forests and Swan Valley, with each recipe presenting featured a ‘hero’ ingredient unique to each region and seasonality was key in produce selection by both chefs and talent. For more information regarding WA’s Celebrity Signature Dish and to access copies of the recipes from this year’s competition visit www.buywesteatbest.org.au.